A few of these are already in bloom in Zone 4, with Zones 3 and 2 to follow. That’s right, here we have a large class of perennials hardy to minus forty Fahrenheit (Saskatoon, for my Canadian visitors). Lungworts are a semi-shade plant that I could envision surpassing hosta in popularity given more promotion. Whereas most of the lip-smacking surrounds their wonderfully diverse, speckled, mottled, and streaked foliage, their floral display is certainly something to sniff at. Lungworts are low-growing plants with a beefy, fibrous root system that allows the plant to clump out quite quickly, without being invasive. ‘Milky Way’ is a recent introduction featuring rich, silver-spotted leaves and blood red flowers. Pulmonaria longifolia sports several varieties known for their narrower leaves. Most of the pink-blooming varieties are Pulmonaria angustifolia, and you will find several varieties of the species at your nursery. Imagine lungworts to be smallish hosta with irregular spots instead of stripes. Except they’ll tolerate more direct sun. They are wonderful as single specimens mixed in with hosta, astilbe, lamium, asarum, aquilegia, polemonium, heuchera, polygonatum, ferns, and all the usual semi-shade suspects. Very useful as an all-purpose groundcover. In the garden bed, place them near the front where they can be readily seen. 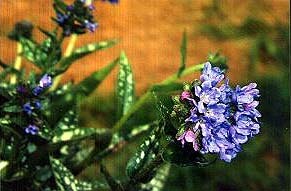 They are easy to divide (divide in spring right after blooming) and hardy as granite. Can be grown in full sun in areas where they are not allowed to dry out. All lungworts bloom in the spring, and don’t give much re-bloom when deadheaded. Still, deadheading is a good idea for the sake of appearance. Later in the season, if foliage is ragged, you can remove older leaves to spark fresh basil growth.